Most people remember braces as yet another part of an awkward adolescence: metal tracks, elastic bands, and unfortunate food choices. Associate Professor Paul Schneider is the Head of Orthodontics at Melbourne Dental School and says early in the year is a great time to get started for orthodontic treatment. But those of us who had braces in the 80s or 90s recall the limited options available. The biggest choice we had was whether we wanted coloured elastic ligatures or just plain ones. These days the options are somewhat broader with traditional metal braces, tooth coloured ceramic braces, braces behind the teeth and clear aligners viable options for different treatment needs. Instead of being a major cause for anxiety, orthodontic patients find themselves in good company with high profile celebrities sporting braces: Emma Watson, Gwen Stefani, Beyoncé and Tom Cruise. While no one doubts that straightening out a smile can be a big motivator, orthodontists will tell you that straight teeth are not just about aesthetics, but about improving the health and condition of the whole mouth and face. Proper dental care, including straightening teeth, contributes to better overall health. Orthodontic treatment can correct a jaw deformity, crowded teeth or misaligned bite (known as malocclusion), and speech or breathing difficulties caused by the misalignment. Crooked teeth are also more difficult to clean, which can lead to increased risk of tooth decay, gum disease or tooth loss. The University of Melbourne runs a teaching clinic where students of the Melbourne Dental School can experience the real treatment needs of clients under the supervision of registered specialists. Orthodontic students are qualified dentists undertaking a specialisation. They work under close supervision of clinical specialists, using the best equipment similar to what they would find in their own clinics. “We have access to the latest digital technology to assist with efficient and comfortable orthodontic treatment,” says Associate Professor Schneider. 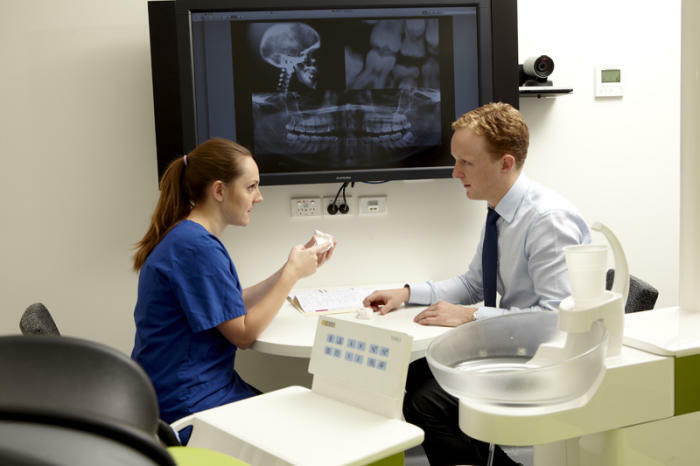 The digital technology at the clinic allows students to view the entire mouth in 3D where they are able to diagnose and build a treatment plan for the whole mouth and individual tooth position. In special cases, the clinic is able to manufacture appliances for the specific needs of a complex case which can reduce treatment times. This practice is becoming more and more widespread across private clinics and is available for students while they undergo their clinical training. Anna Scott is a third year Doctor of Clinical Dentistry student. “It’s good that we’re getting real world experience and a spread of treatment options. Patients like it too,” she says. The Melbourne Dental Clinic is an independent, not-for-profit teaching clinic providing ethical practice and a quality treatment and learning experience. Each patient is given treatment options most appropriate for their own needs and circumstances.